Need a midwinter beach day? No need to get on a plane. 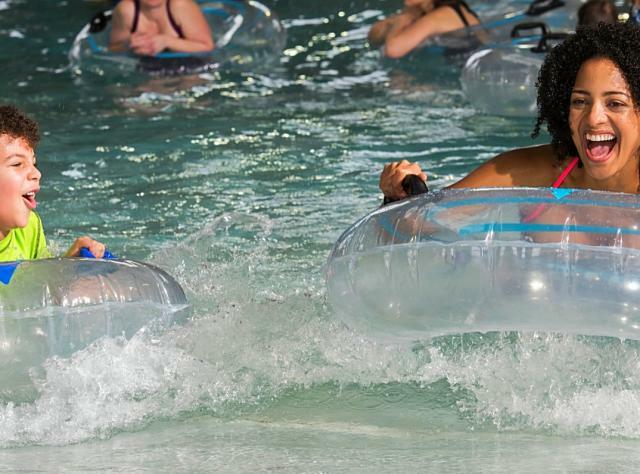 These indoor water parks and water spas offer balmy bliss no matter what the thermometer says. For splashy fun and perfect 84° weather every day, head to Hope Lake Lodge & Cascades Indoor Waterpark, part of the fabulous Greek Peak Mountain Resort in the Finger Lakes. Rated No.1 of the Top 10 US Waterpark Resorts by ResortsandLodges.com, this giant playground includes 500 feet of water slides, a three-story tube, wild wave pool, kiddie zone and 1,000-square-foot basketball cove. Enjoy summer fun year-round at Rocking Horse Ranch&apos;s Big Splash Indoor Waterpark (you need to be a guest of the resort to use the water park), where the temperature always stays at 85°. Ride the 250-foot-long flume and try a water-walk challenge. There&apos;s a waterplay station and pint-sized slides for little kids, as well as interactive fountains, dumping buckets and huge geysers. Popular with families since 1958, this Hudson Valley gem was voted a top All-Inclusive Resort in the US by TripAdvisor travelers. The Waterfalls Spa, inside the stately timber-framed Hope Lake Lodge, pampers guests of all ages. Soothing hydrotherapy treatments include a vibrational cromatherapy tub soak, for one or two. Check out specials for kids like the Little Princess package that includes a mani/pedi, glittery updo and a tiara. Six Flags Great Escape Lodge & Indoor Waterpark spouts off near Lake George in the Adirondacks. Kids love the Tall Timbers Treehouse, with multi-level waterslides, hydro-blasters and bucket soakers. Take a leisurely float on a lazy river with sporadic water sprays or try out the thrilling four-person raft adventure. The wave pool&apos;s great for body boarding and surfing; you can even take lessons! Palm Island Water Park in Batavia features two 24-foot-high enclosed slides-one streams outside the building and then runs back inside. Sparkling waterfalls cascade into an underwater-lighted pool, decked out with a basketball hoop. There&apos;s a children&apos;s lagoon and waterplay area, as well as a relaxing hot tub for parents. Experience the blissful benefits of traditional and modern water therapy treatments, indoors and outside, at the luxe five-story Spa Castle in College Point, Queens. Grand outdoor pools are comfortably heated for year-round enjoyment at this innovative water spa. Note: Guests of all ages enjoy the family-oriented venue, but the kiddie pool&apos;s open only in summer.